My family gets together almost every single Sunday (unless the kids sports prohibits me from being there) for Family Dinner. It’s a tradition that has been going on for as long as I can remember. Nowadays we choose themes for our sunday meals and everyone brings a dish to go with our theme. On this particular Sunday our theme was summer/bbq foods. My mom brought this Agave Fresh Fruit Salsa and we all loved it! 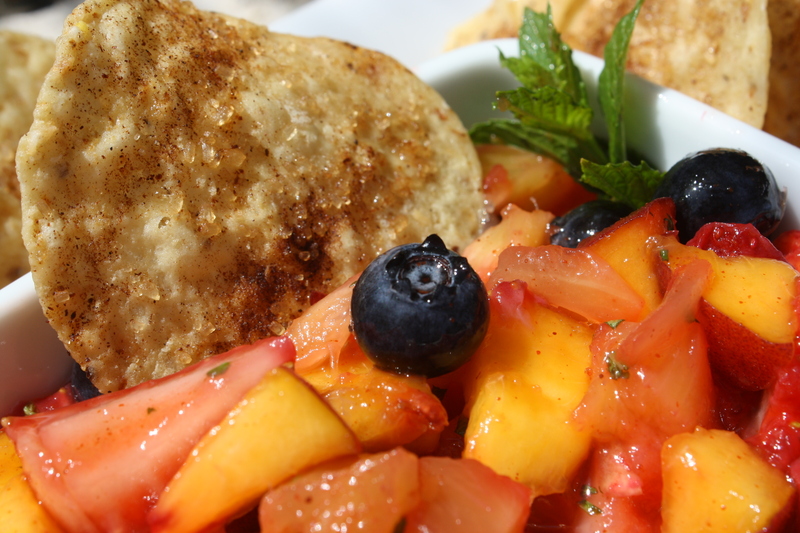 What says summer more than fresh, sweet, juicy fruit? 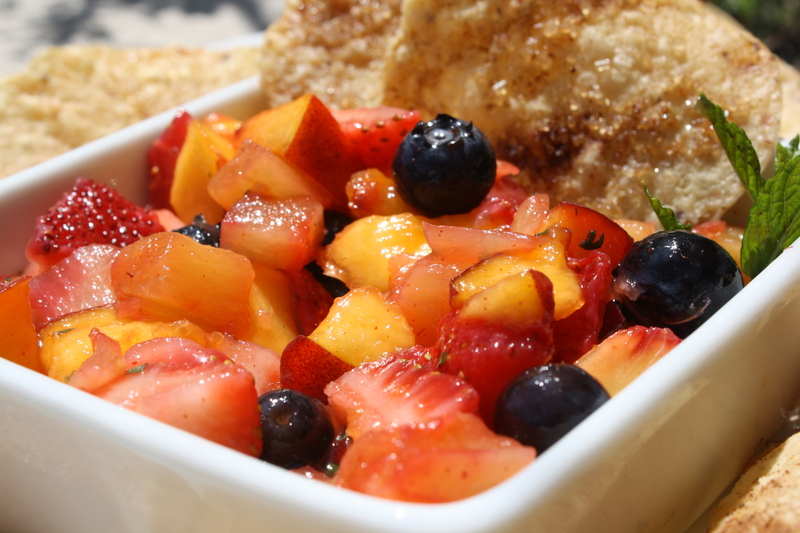 This fruit salsa was delicious, light and refreshing. She got the recipe out of the Wholeliving July/August 2012 magazine. Dice strawberries, peaches and pineapple into 1/2-inch pieces. In a large bowl, combine all fruit and set aside. In a small bowl, combine lime juice and Agave Nectar/Sugar. Add 1 tablespoon of chili powder (increase by teaspoonfuls to reach desired flavor); mix well. Add agave mixture, cilantro and mint to the fruit, tossing until combined. Serve immediately. Grease two cookie sheets or line with parchment paper. Dip tortilla chips into melted butter. Using a pastry brush, remove excess butter to give each chip a thin, even layer of butter on both sides. Place chips on prepared cookie sheet. In a small bowl, combine sugar, cinnamon and chili powder to taste. Sprinkle over buttered chips, and bake for approximately 5 minutes, or until golden. Remove from oven and cool for 5 minutes before serving. Sounds fantastic! I love the idea of the sugar and spice chips! This sounds so luscious and refreshing! Yum! This is my kind of dish. I love the fruit salsa, and the sweet & spicy chips sound amazing. I plan on making it for this weekend’s family BBQ! I hope your family loves it as much as mine did! It’s perfect for a summer BBQ.